New Crawley Town manager Mark Yates wants to bring his own style to the Checkatrade.com Stadium. He is aiming to provide the club’s fans with both winning and entertaining football. Yates said at his first press conference (yesterday) after being named boss: “Crawley are going to get a better manager than they had at Cheltenham. “I want to achieve and bring my style here. The six months out of football has given me the chance to reflect on things I could have done better and also what makes me a decent manager. 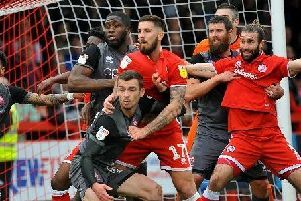 Yates was not put off by Crawley’s reduced budget, which will be cut further by the loss of £300,000 in revenue as a result of smaller funds distributed to the club from the Football League due to being in League 2. He said: “At Cheltenham we had a budget that I had to stick to and it will be similar here. I respect it and know how to deal with it. “At least they are being honest about it, which should put us in good stead over the coming months. Yates said: “As a manager, success for me is I want the play-offs. You have to dream you can do it. All the extra little one per cents with the coaches, the support staff you put behind the players can make a difference at the end of the season and enhance that group togetherness. “You need good footballers, you need to have a structure you work off. Give them that freedom to go and play. “I am going to sit down with Michael Dunford and just work out what we have got, what we need, how we can improve it.